The Book Chook: Let's Celebrate with Picture Books! 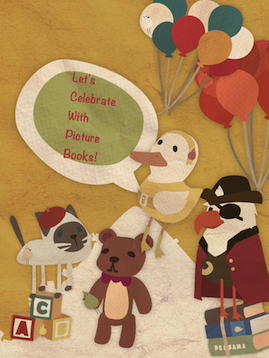 Let's Celebrate with Picture Books! What's so special about picture books? I'm glad you asked. I believe there are several reasons picture books are special. Picture books are often the first books a young child engages with. As such they're responsible for setting his feet on the pathway to reading. How wonderful to think that your son, the Supreme Court Judge, loves to read because you took the time to read to him from picture books! Or that your Kindergarten class has grown up to be successful, happy, literate adults, many of whom still remember those picture books you used to share with them. How many of us can remember a special picture book from our past? Seriously, I imagine most of us can. I see you now, dewy-eyed and smiling as you remember Mulga Bill's Bicycle or The Saggy Baggy Elephant, or Are You My Mother or Where the Wild Things Are. Picture books make an impact on our lives and leave us with lasting memories that just naturally conjure smiles. Picture books are also a wonderful way for children to absorb the features of language without being explicitly taught. They pick up vocabulary, rhyme, rhythm and many other elements of language via picture books. Because kids memorise picture book text from repeated read-alouds, they practise "reading" to toys and parents from the book and this often almost magically grows into real reading. Picture books entertain, and they also make us think. One of the most wonderful things of all though, is that they help children imagine. When reading or listening to picture books being read aloud, children are entering the fictive dream and building imagination muscle. We know our 21st Century learners need to be creative thinkers, and for that, they need imagination. To celebrate the gift of reading, why not buy yourself and your kids a present? There are so many great picture books being published nowadays. In Australia, browse online at The Australian Online Bookshop, compare prices at Booko, try Youtube to find new picture books, or check out my Reviews, many of which are picture books. You could pack lunch and head for a bookshop, make your choices, then visit the park for a picnic and lots of delightful picture book reading. Consider increasing your family read-aloud time. Re-visit old picture book friends and borrow/buy new ones. If your children don't have library cards yet, apply for them today and watch your kids' confidence grow as they choose their own books. How about a picture book party? Bake a picture book cake, dress up as favourite picture book characters, act out your favourite scenes from picture books. Have your kids tried to create their own picture books? Help them out by looking at a range of picture book styles first. Some writers choose rhyme, some present true facts, other spin fantastical tales. Illustrators might use collage, lino printing, watercolour, or sketching. Children will enjoy creating something they feel passionate about and may want to share the book with younger kids too. Find more information in Book Chook Ideas for Making Books with Kids. What's YOUR favourite picture book? You might also like to read: What's the Use of Picture Books? Why Reading Really is Magic What's So Great About Children's Literature? You're right about the value of picture books. They are also very important in terms of visual literacy - the ability to "read" pictures and to gain meaning from the combination of words and pictures. Happy Picture Book Month! Happy Picture Book Month! Sharing picture books is a great way to help kids develop their visual literacy skills, skills they'll use throughout their lives. They'll learn to "read" pictures and to create meaning by combining word and pictures through exposure to picture books. Picture books can also touch the emotions and awaken interest in a subject, one of the reasons many middle school teachers use them to introduce new units. Great points, Elizabeth! I love to think of teachers using picture books with older kids, because they are so often the "essence" of a subject and make a wonderful jumping off point. I love picture books too! Our favourite is Eric Carle's Brown Bear Brown Bear, I remember it was the 1st book that my then toddler son grabbed every time I plop him down in front of his books. I guess the bright colors and repetitive words catch his attention. From there he progressed to Eric Carle's other titles and then follow by other authors. My current favourite book is Today I Am by, a book with colorful fish about emotions. Great choices, DinoMama! I totally understand the fascination with Brown Bear, Brown Bear. The simplicity and rhyme is so engaging and leads to lots of language-related fun. I agree that picture books are important as a child's first contact with literature and often art too. They're also a whole lotta fun. Now that my daughter is grown, I miss picture books! Sometimes I still pull out my favorites and read them in secret. Shhh! Your secret is safe with us, Kim! And I bet one of those favourites is still Eek! Creak! Sneaker, Sneak. Picture books are so underappreciated by teachers of Years 3 and up. I'm working really hard to expose them to picture book biographies and picture books that can be used as mentor texts for writing instruction. Thanks for the links to Australian book stores. I've been going through Fishpond because that was the only one I knew. Can I pick your brain sometime on how you get some of the best prices on books? Picture books as mentor texts makes such perfect sense, Janet. They're such great models of writing tightly too. It's wonderful that you're being a picture book ambassador here at your new school. Please pick my brain anytime! Use the tiny little "contact me" top left and I'll get back to you asap. +Mia Wenjen from http://www.pragmaticmom.com says: "I love picture books for the rich language, beautiful illustrations that tell part of the story, and a complete story with a beginning, middle and end using only a few dozen pages."